Potent water retention capability, with its high concentration of Hyaluronic Acid. Instantly replenishes your cells with water, creating an ideal environment that nurtures and heals your skin. Hyaluronic Acid, a molecule that binds together collagen fibrilis in the connective tissue, helps to bond moisture within the inter-cellular spaces. It forms a thin, transparent, viscous-elastic film which fixes moisture onto the surface of the skin similar to what occurs naturally in the tissues of the body. Ideal for all skin types requiring extra hydration. Hyaluronic Acid plays an important role in tissue hydration, lubrication and cellular function, and is able to hold more water than any other natural substance. 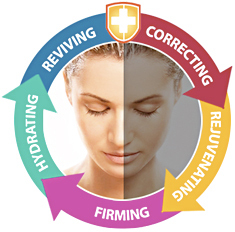 It's unmatched hydrating properties result in increased smoothness, softening and decreased wrinkles. It uses exclusively Hyaluronic Acid produced by proliferation of micro-organism, a bio-synthetic process. It is a far more advanced production process than most of the Hyaluronic Acid on the market, which is produced with low cost by hydrolyzing animal parts. Bio-synthesis is also safer. Since it is of non-animal and non-plant origin, it eliminates the risk of diseases and greatly lower allergy problems. Contains GC-100 and Pentapeptide (Matrixyl), which stimulates your cells to synthesize collagen. Your skin will be better able to resist wrinkle formation and damages.